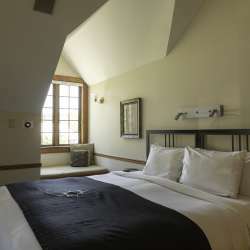 A short 12 miles from downtown Traverse City, nestled among Leelanau’s orchards and vineyards, is a getaway that feels worlds away from the ordinary, Black Star Farms. 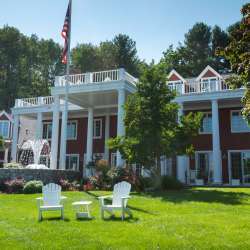 It’s an exceptional 160-acre estate that truly seems to have it all….a highly regarded winery and distillery, a centennial barn for larger events, a farm-to-table café, equestrian facilities, an expansive network of nature trails, and, most notably, the signature Inn at Black Star Farms. With so many unique amenities, and a well-earned reputation for generous hospitality, it’s no wonder the property is such a popular destination. “We’re the only winery estate in the Traverse City area,” explains General Manager, Sherri Fenton. “So in many respects, we’re quite self contained. It’s common for guests, often couples, to stay here without ever leaving the property.” It’s easy to see why. Upon arrival, guests gladly discover a bottle of wine waiting for them in their rooms. They can also partake of the daily hospitality hour, which includes free wine and hors d’ oeuvres. For dinner, guests can enjoy casual, farmstead fare at the on-premise café or experience one of the Inn’s signature dinners, which include—depending on the calendar— Seafood Paella Nights, Great Lakes Fish Boils, and the rotating Harvest Dinner Series. After a night of luxurious slumber, guests awaken to a gourmet breakfast, which includes house-made baked goods, granola, fresh (often local) fruit, yogurt, and a made-that-morning hot entrée. As for the rest of the day, the options are wide open.